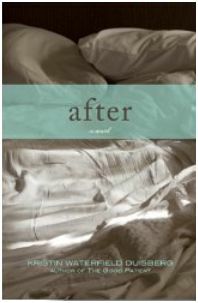 What I appreciated about Kristin Waterfield Duisberg’s novel, After, is that the family she created is as real as your family or my own. Nina Baldwin faces cancer and its aftermath while she juggles her relationships with her husband, Martin and their intelligent, autistic daughter, Audrey. When I first started reading I was dismayed to find out it was (yet) another book about breast cancer, but I soon realized that this was not a book about cancer. It is instead a book about relationships, the secrets we keep, the hopes and worries we have for our children, and the difference between marital promises, and truly loving a person. Nina’s choices, Martin’s surprising background, and Audrey’s navigation of her tweens make these flawed characters feel just right. The Baldwins are your next door neighbors; the family that you whisper about in the dusk of your homes; the people you believe you will never be, yet you know that you are just one misstep from their lives being yours. For these reasons, After has been added to my list of favorite books.